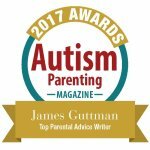 Balancing Autism and Discipline – Hi Blog! I'm Dad. My son is a bit of an iPad connoisseur. He has one through his school that is used for communication. He has one in a big blue spongy case that has all his great apps on it. Then there’s also a third one that the rest of the family uses which is smaller than his and has less fun things on it. And he can’t wait to get his grubby little hands on it. I always know when he’s scoping it out too because he’ll walk into my home office very inconspicuously. Sometimes he sidesteps in slowly as if he’s a spy from an old black and white film. Then, just as he thinks no one is looking, he’ll pounce and tear it from the plug. When I rush after him to grab it, he cowers or tries to run in the opposite direction. It’s just one of many ways I know he’s aware that what he’s doing is wrong. Despite being non-verbal and having Autism, his take on getting that iPad is calculated beyond what most would assume are his capabilities. Just yesterday, after what I assumed was a tiring day, he was sitting quietly on the couch for about ten minutes. It was all very low key and I genuinely believed he was on the verge of falling asleep. I thought nothing of it as I stood up and left to get a drink. I returned to the room to find my daughter holding the forbidden iPad, plug dangling below, in her arms like a top secret briefcase while the little movie spy was reaching for it and crying big crocodile tears. She looked at me and through laughter explained what happened. Daddy. Daddy. The second you left – like the very second – he ran right to it. The second! I thanked her and knelt down in front of Lucas. His face was scrunched up into a melodramatic grimace as I waved my finger back and forth. No, no, no. Lucas. No. We don’t take that iPad. You understand? No, no, no. Now you do it. He knew what that meant and hated doing it. Angrily, he waved his hand from side to side in the same motion that I did to show that he understood. That’s the main way we deal with that situation. That’s not to say that if he persisted or struck out in anger, he wouldn’t be sent to his room. We’ve tackled that situation before much like making him return to the scene of a careless spill to help clean up what he’s dropped. It’s part of parenting and doesn’t stop because my child has Autism. It just takes more effort to understand the times that call for discipline and the times that don’t. People without special needs children may have a misconception as it relates to disciplining a child on the spectrum. They’ll see my son jump up, seemingly out of nowhere, in a fit of excitement and clap his hands together in tune with a massive scream. Then, they see me do next to nothing. I might rub his back or try to sooth him in some way, but I don’t react to that action in a manner that others might expect. To them, he’s a six year old boy screaming in the living room during a large gathering. Their brain tells them he needs to be reprimanded. He doesn’t. Yelling at my son for screaming with excitement is like yelling at a person in a wheelchair for sitting too much. Sure, conventional wisdom says that people shouldn’t scream or sit all day. However, in these cases, those actions aren’t being done out of malice or laziness. Most people can see that. Some can’t. In the end, though, those people don’t really matter in this situation. We, as parents and caregivers, matter. We’re the ones who have to know the difference between naughty behavior and uncontrollable actions. We have to be able to differentiate between a six year old crying because he wants to eat all the cookies in the house and crying because something confuses or scares him. Parenting a child with Autism has three different avenues to take when it comes to discipline. You can allow nothing – no leeway at all. Repetitive or stimulating behavior, shouting out, the inability to listen or follow directions, and others can all be things you punish them for. You can spend your days in a constant fit of anger trying to correct behavior that other children don’t display. Of course, it won’t get you anywhere and just make life miserable for everyone. It’s the worst possible approach and no one should ever do that. Then, there’s the completely opposite direction. You can allow everything. Crying over a juice box? Give him a juice box. He wants to watch The Wiggles in the middle of a family movie? Change the channel. He wants to throw your wedding band in the toilet? Aw, he’s learning how potties work. So cute, right? Wrong. Your child will eventually grow up. Then, the adorable little boy with adorable little eyelashes will be a regular sized man with regular person eyelashes. They’ll be a part of a world that won’t be so easily swayed to allow them to do as they please. While certain uncontrollable behaviors may stay with them for a lifetime, it’s our job to minimize the ones that are in their control. We’re the ones who have to differentiate one from the other and, once again, it’s not exclusive to Autism. With any child, you find yourself making the distinctions between whether or not your kid is old enough to know it’s rude to plunge her hand into Grandpa’s birthday cake. The same can be said for my son, although he can be a bit tougher. But raising him to be the best person he’s capable of being has to be done – for our family, for our community, and for him. Wherever my son ends up will be fine with me. Maybe one day he will start speaking and catch up to all his missed milestones. Maybe he won’t. Either way, I’d hate for him to become an adult and realize that while we were so busy focusing on his development, I accidentally raised him to be a brat. Thank you so much, Melody. I am totally with you on the struggle and the worry. I’m so glad I’m able to share our stories with others in similar situations. It’s easy to feel like you’re the only one sometimes. Hearing from other parents like you reminds me I’m not.